Hierarchical maps system: complete end-to-end network view and inventory (Google Maps are supported). Possibility to define "logical views" for group of devices in addition to "geographical" views. New! 24 x 7 performance and availability monitoring at multiple levels: network/map/submap/device/interface/port. Scalable to virtually unlimited number of network nodes (CloudView NMS server still can be simple desktop PC). Auto-discovery (via several standard protocols). "Top 10" feature allows to report most used or most faulty ports/interfaces in large networks. Historical reports (up to 3 months) of real ports/interfaces rates/utilization. Other historical data displayed in graphs. Graphical links representation and link status background monitoring. Capability to manage / monitor any vendor SNMP or TCP/IP compliant devices. depending of the output pattern, some action (e-mail/SMS/sound, running shell script…) can be performed. custom MIB monitoring applications and assign it to 3rd party devices. SNMP MIB Browser included. Capability to create unlimited number of SNMP probes even without compiling your MIBs (using "raw" SNMP OIDs). New! 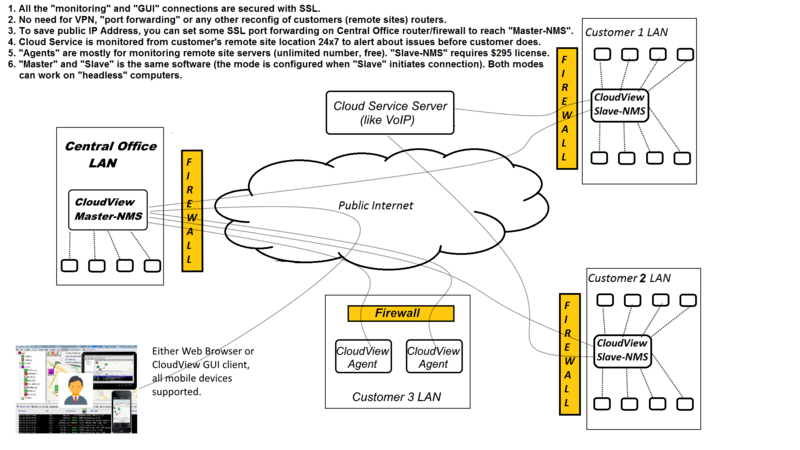 Client-server multi-user system with multiple user profiles. Optional capability to use MS Windows Authentication and profiles. CoudView NMS server is supported on all modern OS platforms including Windows, Linux, Mac OS, Solaris and Raspberry Pi. service providers to access their customer's SSH-devices over public Internet without VPN or port forwarding. New! Both IPv4 and IPv6 supported. MTConnect support per standard (http://www.mtconnect.org), for factory/shop floor devices monitoring. New! system can automatically SSH-login in every server to "poweroff" it. Thousands of sensors/servers can be supported. New! Included special support for Cisco SNMP agents and MS Windows SNMP agents. Email/SMS alerts of events/alarms and/or SNMP Traps with customized filters. computers either via SNMP or via CloudView NMS Agent. New! Capability to forward all the alarms to other NMS/OSS as SNMP Traps, TL-1 asynchronous messages, sysLog messages. Current Alarms Log (vs. History Alarms Log) shows only current problems. Sophisticated alarms correlation algorithm is used. about newly hooked up devices. New! Powerful event monitoring with configurable alarm actions, scripts and sounds notification. IT Automation features. TL1 Northbound interface, TL1 gateway and TL1-SNMP translation software for any SNMP capable device, TL1 proxy. XML Northbound interface, XML-SNMP translation software for any SNMP capable device, XML proxy. SNMP Northbound interface, CloudView comes with its own SNMP Agent and supported private MIB. Carriers / Service Providers features: Service Monitoring, SLA calculation reports, Customers self monitoring portals..
Device/NMS Actions scheduler feature allows to schedule important device/network maintenance operations. customer's network and securely (over SSL) monitor all remote locations (see here) from "Central Office" unified console. customer's router. 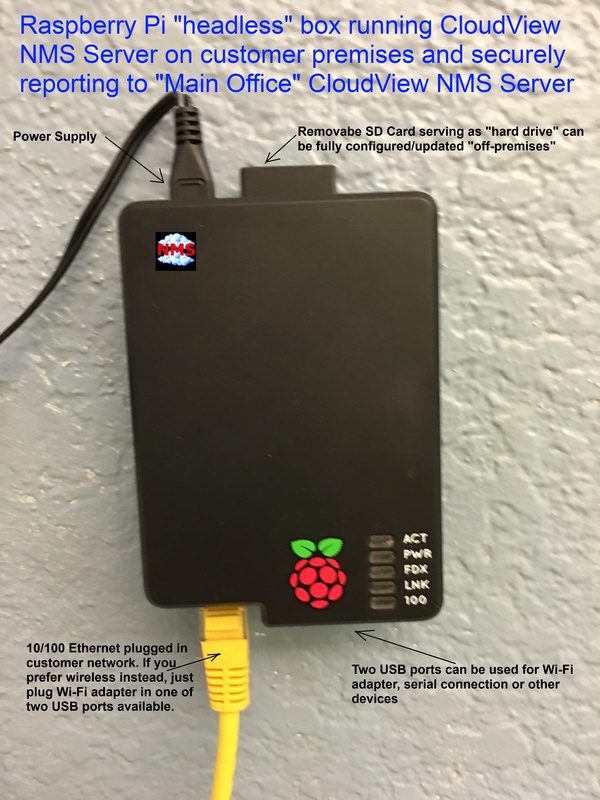 The "on-premises" Slave-box can be as small and cheap as Raspberry Pi Linux box ($35.00). Capability to run CloudView server as Windows service or Linux/Unix boot daemon. Special app for monitoring web sites performance and response time. Also websites can be monitored for changes. the above resources usage and receive corresponding events in the Events Log and as e-mails. for battery power left, WiFi level, storage left, geolocation, ... etc. Please see also our FAQ (Frequently Asked Questions) page which illustrates some of the above features with screenshots.